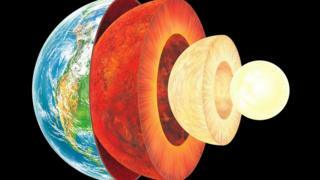 Japanese scientists believe they have established the identity of a "missing element" within the Earth's core. They have been searching for the element for decades, believing it makes up a significant proportion of our planet's centre, after iron and nickel. Now by recreating the high temperatures and pressures found in the deep interior, experiments suggest the most likely candidate is silicon. The discovery could help us to better understand how our world formed. Lead researcher Eiji Ohtani from Tohoku University told BBC News: "We believe that silicon is a major element - about 5% [of the Earth's inner core] by weight could be silicon dissolved into the iron-nickel alloys." The innermost part of Earth is thought to be a solid ball with a radius of about 1,200km (745 miles). It is far too deep to investigate directly, so instead scientists study how seismic waves pass through this region to tell them something of its make-up. It is mainly composed of iron, which makes up an estimated 85% of its weight, and nickel, which accounts for about 10% of the core. To investigate the unaccounted for 5% of the core, Eiji Ohtani and his team created alloys of iron and nickel and mixed them with silicon. They then subjected them to the immense pressures and temperatures that exist in the inner core. They discovered that this mixture matched what was seen in the Earth's interior with seismic data. Prof Ohtani said more work was needed to confirm the presence of silicon and that it did not rule out the presence of other elements. Commenting on the research, Prof Simon Redfern from the University of Cambridge, UK, said: "These difficult experiments are really exciting because they can provide a window into what Earth's interior was like soon after it first formed, 4.5 billion years ago, when the core first started to separate from the rocky parts of Earth. "But other workers have recently suggested that oxygen might also be important in the core." He said that knowing what is there could help scientists to better understand the conditions that prevailed during the formation of the Earth. In particular whether the early interior was one where oxygen was greatly limited - known as reducing conditions. Or whether oxygen was in abundance, which is described as oxidising. If a larger amount of silicon had been incorporated in Earth's core more than four billion years ago, as suggested by Prof Ohtani's results, that would have left the rest of the planet relatively oxygen rich. But if, instead, oxygen was sucked into the core that would leave the rocky mantle surrounding the core depleted of the element. Prof Redfern said: "In a way, these two options are real alternatives that depend a lot on the conditions prevailing when Earth's core first began to form. "The most recent results add to our understanding, but I suspect that they are by no means the last word on the story." Prof Ohtani presented his research to the recent Fall Meeting of the American Geophysical Union in San Francisco.